Charitable Foundation to Support Skilled Workforce and Their Families in Sonoma County. Santa Rosa, Calif. (January 14, 2016)—As they move closer to their quest to become the first 100% sustainable winegrowing region, Sonoma County Winegrowers announced they are expanding their efforts in 2016 to focus on the socially-responsible component of sustainability with the relaunch of the Sonoma County Grape Growers Foundation. The Foundation will work with a number of community-based organizations and government agencies to provide resources and support for agricultural employees and their families. The Foundation was first established 2002 to focus on employee education and safety. Following a year of discussion and planning on the best means for positively impacting the lives of agricultural employees in the county, the boards of both the Sonoma County Winegrowers and the Sonoma County Grape Growers Foundation met in December and voted to relaunch the foundation which will be managed by the Sonoma County Winegrape Commission. 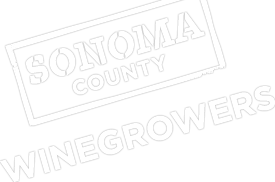 The Sonoma County Grape Growers Foundation’s relaunch continues Sonoma County Winegrowers’ recent tradition of making major announcements at its annual Dollars and $ense Seminar and Tradeshow. Two years ago, the Sonoma County Winegrowers generated national news when it boldly announced it would become the nation’s first 100% sustainable winegrowing region by 2019. The march towards its 100% goal picked up major momentum in 2015 according to the findings in the just-released Second Annual Sustainability Report. With the target date of 2019 for 100% compliance, more than half of Sonoma County’s vineyard acreage has been certified by a third-party auditor putting the effort well ahead of original projections. In 2015, the organization unveiled its 100-year business plan which it developed to preserve agriculture in Sonoma County well into the 22nd Century. The 100-year plan is believed to be the first of its kind in agriculture and the global wine industry. It was also the next step in the evolution of Sonoma County’s efforts to have all of their wines grown and made in a sustainable manner. With today’s announcement of the new focus of the Foundation, Sonoma County’s wine sustainability effort is truly a model for the world’s wine community and other industries looking to become sustainable.